Students enrolled in Mr. Murray’s Military History course are bringing their research and studies of the American Revolution to life. Through historic interpretation and documented analysis, students set out to recreate the life of the common soldier of the American Revolution. Research has shown that such simulated, experiential learning of living history helps to motivate and enrichen student learning. However, living is extremely difficult to achieve in the traditional classroom. When the thousands of conventional lessons are long forgotten, people vividly recall their living history experiences decades later as if they happened only yesterday. This teaching technique also instills values of patriotism, an appreciation of veterans’ sacrifices, the desired support and use of local historic sites and their preservation. And it is enjoyable! Living history helps students remember those who made the ultimate sacrifice. Living history does not glorify war, but serves as a daily reminder that the freedom and privileges we enjoy come with a cost. Freedom is not free. Students gain a better understanding of the life of the common soldier as well as the daily life of those who came before us and founded our country. By living the life of those who came before us students will resolve to remember those in uniform today around the world carrying on the tradition and the ideal that we still are a nation conceived in liberty, dedicated to the protection of democracy throughout the globe. With the historic Graham Brush House as a backdrop, we set out to recreate life in 18th Century New York. Adhering to a high level of authenticity, driven by primary source documentation, students are able to step back in time and live the ideas, technology, clothing, speech, and even food or an era. As part of Mr. Murray’s living history program, and supported by the Pine Plains VFW & American Legion, students marched in authentically reproduced uniforms to the Evergreen Cemetery. Utilizing student research, students set out to honor and remember the soldiers of the American Revolution buried there. Each soldier was honored with a brief bio, an official salute, and an American flag. We were honored to be joined by veterans Bob Clinch and George Keeler who supported the program with their presence and provided the American flags. 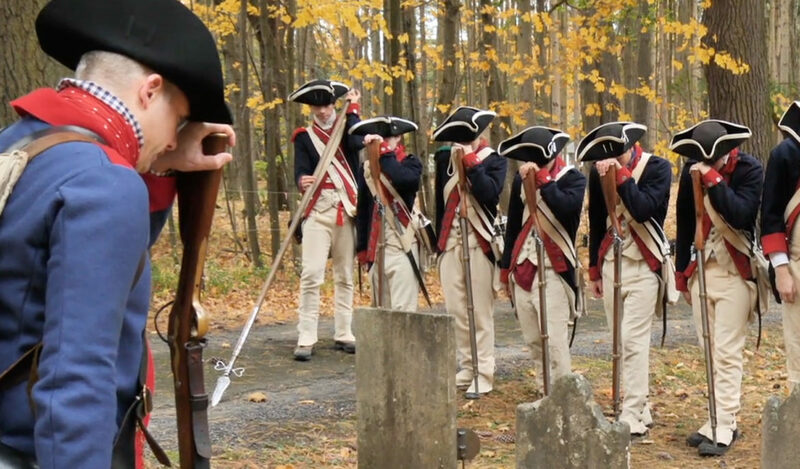 The ultimate goal of this component of the trip was for students to make connections between their research, their living history experience, and the real-life soldiers of the American Revolution buried right here in Pine Plains. We can’t thank the administration of the Pine plains Central School district, the Board of Education, the VFW & American Revolution, and the Little Nine Partners Historic Society enough for making this student-centered experience a reality. We pick up with the soldiers as they march back to the Graham Brush House after their visit to the cemetery. Is this not the best Show and Tell ever?